I'm OnCall provides basic remote support for Windows and Mac PCs. Easy to customise and easy to use. Avatars give a friendly face to remote technicians. No options for supporting mobile devices. User must remain present if technician needs to continue support after remote PC is rebooted. $99.95 per technician per month. Launched in May, I’m OnCall 1.1 is a web based remote control system designed for help desks and technical support organisations. New in this release is support for Macs and 64-bit Windows, plus enhanced multi-monitor support. The suite is hosted by 01 Communique and in our tests it worked well with Microsoft Internet Explorer 5.5 or later and Firefox 1.5 or later. Privacy and security are handled using 128-bit SSL encryption and the fact that remote access sessions must be initiated by someone using the remote device. Unlike similar products that provide a choice of remote viewing or remote control capabilities, I’m OnCall provides full remote control all of the time. It works with PCs running 32- and 64-bit versions of Windows and Mac OS X, and prices start at $99.95 per month per technician, with discounts for annual contracts and organisations with three or more technicians. Features for system administrators include the ability to see which technicians are currently logged in and which incidents they are handling. Administrators can also reassign incidents to other technicians, although technicians cannot do this on their own. We were impressed by how easy it is for an organisation and its technicians to get up and running with I’m OnCall. No installation is required, technicians simply log into I’m OnCall’s web site using a Windows PC and they’re ready to work. We found administrators could replace most of the I’m OnCall branding with their own company logos, and technicians could upload photographs of themselves to be used as Avatars, which gives a friendly and personal look and feel to the organisation from an end user’s perspective. We added The Hypervisor’s logo and our own avatar to our test account in about two minutes. We also found the user interface available to the technician was clean and simple. Along the very top of the I’m OnCall console there’s a few tabs for accessing the main pages, which deal with “Incidents”, “Users”, “Billing” and so on. Technicians will spend most of their time working with the Incidents page. When a user has a problem they would contact the help desk, and a technician would enter a few details about the problem using a button at the top of the Incidents page labelled “Open New Incident.” Immediately below this is a list of existing incidents, showing a few details about each and which technician is assigned to handle them. There’s a corresponding “Close Incident” button that technicians use to sign off an incident once they feel the end user is up and running properly again. Below the incidents section there’s a list of remote sessions. To setup a new remote session the normal sequence of events would be for the technician to press the “Start” button to generate a unique session code number. The technician then needs to ask the user to visit the I’m OnCall website and enter the session code. The user’s browser then asks for confirmation before downloading and installing the remote control software. At the same time, the technician’s PC also downloads some remote control software, and once both sets are installed and running the two PCs should establish a remote control link. In our tests we found the remote control window had a few buttons to control commonly used functions, such as to switch between full screen and windowed views of the remote desktop, and to control remote sound and file transfers. 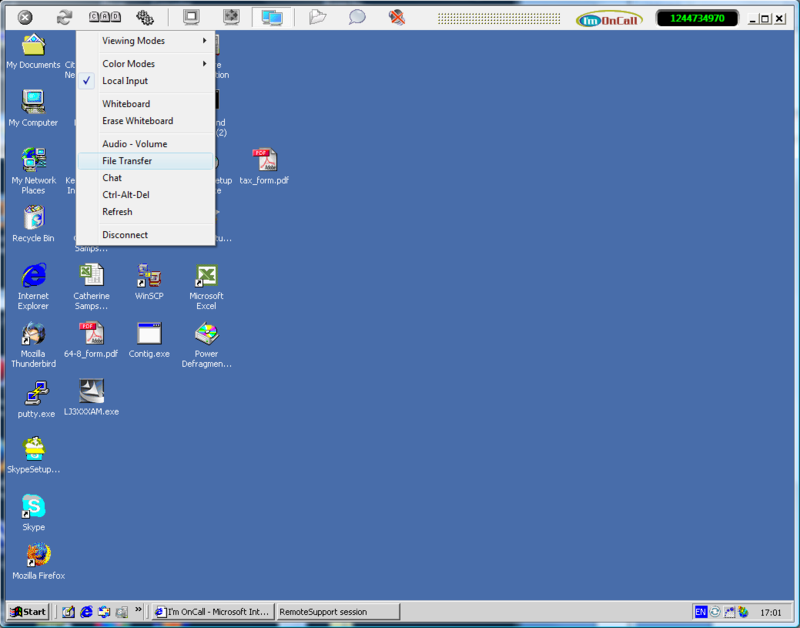 An “Options” menu provided text links to the same features, plus a few more, for example, to change the color model used for remote sessions to trade off image quality against the time needed to synchronise the technician’s display with the user’s desktop. There was also a “whiteboard” facility that allowed the technician to draw on the remote screen, for example, to highlight a button that the user should press. Technicians could also use a text based chat facility to exchange brief text messages with the remote user, and could reboot the user’s PC by sending a “CTL-ALT-DELETE” keystroke to access the Windows “security” dialog box and “Shutdown…” option. However, the remote control session is not restarted automatically once the PC has been rebooted. We found the user needed to go back to the I’m OnCall website and re-enter the session code to reconnect the technician’s display. This review was published on Monday, June 15th, 2009 at 3:23 pm. You can follow any responses to this review through the RSS 2.0 feed.